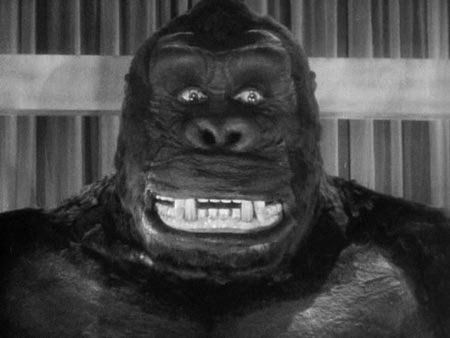 I suppose the best thing I can say about the original King Kong is that it’s pretty impressive for a film made in 1933. Clearly the film can’t hold a candle to today’s epic special effects driven mega movies, but as I was watching it I imagined what it may have been like for an audience member to see this film on the big screen back in the 30s and it was probably pretty darn impressive. I doubt anyone thought the creatures looked real, but the size and scale must have been something to behold. The plot, however, is flat-out ridiculous and the acting is the scariest thing in the film. I’m sorry if you think this film is some sort of landmark motion picture, but it’s just silly. A giant killer gorilla lives on an island in the Pacific along with dinosaurs and aboriginals who sacrifice young ladies to the beast? As Seth Meyers would say — really? And then after the great ape kills half the crew they capture it and bring it back to New York where it escapes, grabs the girl and climbs up the Empire State Building only to be shot down by bi-planes? Really? And then the moral of the story is that it was beauty that killed the beast. Really? Truly the most memorable thing about King Kong is actress Faye Wray’s screams. That and the scene where Kong battles a giant T-Rex to the death and wins by snapping the dinosaurs mouth open. Nice. Undoubtedly this film gave the Japanese the inspiration for Godzilla Vs. Mothra!